Vegetarian is a word we regularly hear and maybe it conjures an image of a pale, skinny bloke in sandals, shorts and glasses on a mission to save the world. The truth is it’s estimated there are more than three million vegetarians in the UK and many celebrities are vegetarian, including Paul and Stella McCartney, actors Jerome Flynn and Woody Harrelson, comedians Victoria Wood, Sean Hughes and Dave Spikey, and musicians Moby and Heather Small. The Vegetarian Society defines a vegetarian as someone who eats no meat, game, poultry, fish, shellfish or slaughterhouse by-products of any kind. A vegetarian eats basically anything that grows, which means cereals, nuts, seeds, fruit, vegetables, pulses. Some vegetarians also eat and drink dairy products like milk, butter and cheese (because cows do not have to die to produce them), and eggs. Strictly the term for someone who eats dairy products and eggs is lacto-ovo-vegetarian. If they don’t eat eggs, it’s just lacto-vegetarian. A vegan eats no animal products of any kind, which includes honey. Many religions around the world require vegetarianism, or apply many of the same rules as vegetarians because the meat they eat must be, for instance, halal or kosher. If you choose to become vegetarian, at some point you will have to decide how strictly you want to stick to your diet. If most of your friends and family eat meat it may be hard for them to get used to catering for your new diet. Consider the Sunday family roast. Usually the potatoes are cooked around the joint. This may be a problem for vegetarians who would prefer their food not to come into contact with meat of any kind. At home this kind of mix up is easy to sort out, but eating out can be more of a problem. Items on the menu that appear suitable for vegetarians may have been cooked in a fish or meat stock, or fried in animal fat. In practice you should expect that meat and vegetarian food is prepared separately, and more and more restaurants are labelling vegetarian options on their menus. If you have doubts, you will have to decide if you want to ask the waiter or the chef whether their food meets your expectations. Similarly, some favourite products like biscuits and sweets may contain animal by-products like rennet and gelatine and you will need to decide how strict a vegetarian you want to be. Some people worry that it will be hard to find things to eat and that you have to spend your life eating nut roasts, but this is far from the truth. The fact is you can do your shopping as normal in the supermarket, and there are now dozens of vegetarian ready meals to choose from if you don’t fancy cooking from scratch. And they aren’t all weird dishes you’ve never heard of before – many are just vegetarian versions of familiar dishes, like lasagne or curry. You shouldn’t worry that you can no longer join in with events with your family and friends just because you’ve decided not to eat meat. 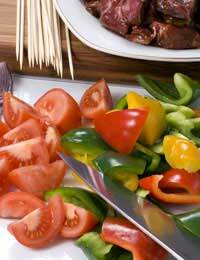 Even barbecues can still be enjoyed by veggies – vegetarian burgers and sausages are fine, or a vegetable kebab cooks well on a grill. Vegetarians can still eat roasts, curries, stir-fries or whatever anyone else is eating – it just means finding alternatives to the meat, or eating the same as everyone else but cooking the meat separately. Remember to warn people before you go to dinner that you are a vegetarian. If it sounds like it might be a problem, offer to take your own food or suggest something simple they can buy and just throw in the oven – after all it’s about the company, not just the food. Start reading the labels of the items you buy to check for hidden animal products. Some things may surprise you with the ingredients. Learn what to look out for and avoid. Remember some curry sauces – particularly Thai curry – contain fish paste, and Worcestershire Sauce often includes anchovy. With this basic understanding of what being a vegetarian entails you’ll soon be on the right track. Try not to think of it as a challenge, but rather an adventure as you learn new things and discover new tastes and ways of eating. You might miss meat to begin with, but in no time you’ll have some new favourite vegetarian meals, and if you have the odd setback, don’t worry – every vegetarian meal you eat is one less animal killed.